This is a project completed in 2001, but I wanted to show it here because of THIS great link for a 360-degree panorama of the finished project. 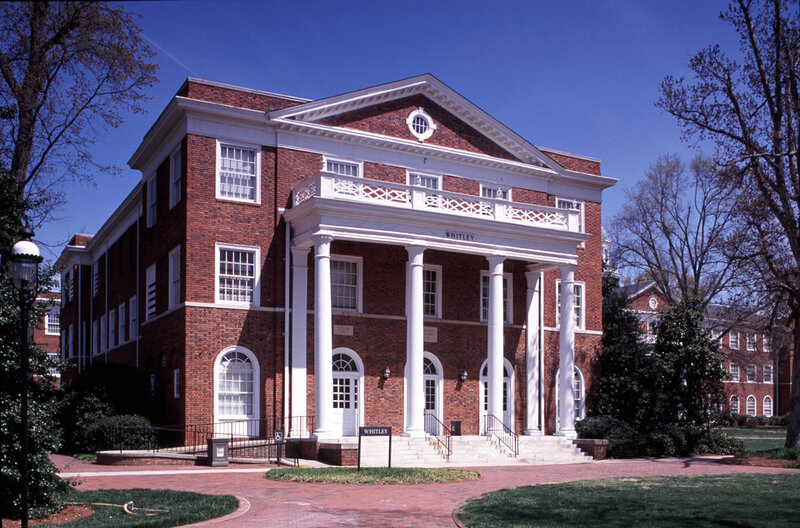 The renovation of the historic 1924 Whitley Auditorium at Elon University provides a much-used recital space for the Music Department as well as a multi-purpose space that is used for lectures, classes, as well as weekly church services. The auditorium was renovated, new classical columns and scrolled brackets to support the balconies were added to cover existing steel columns, acoustical improvements were initiated, new handicapped accessible restroom facilities were carefully fit below the existing stairways, the lobby was extended and improved for better traffic flow and a more welcoming atmosphere, and refurbished vintage auditorium seating was installed. A new state of the art HVAC system was designed to provide quiet temperature and humidity control for concert patrons and to maintain the tuning of the new Casavant Frères pipe organ.